During the winter of 1960-61, Janet and Martyn Baynes, Frank and Jill Williams and other friends and work colleagues decided to form a local drama group. The Roman name for our village was an obvious choice so the “Petuaria Players” were born. 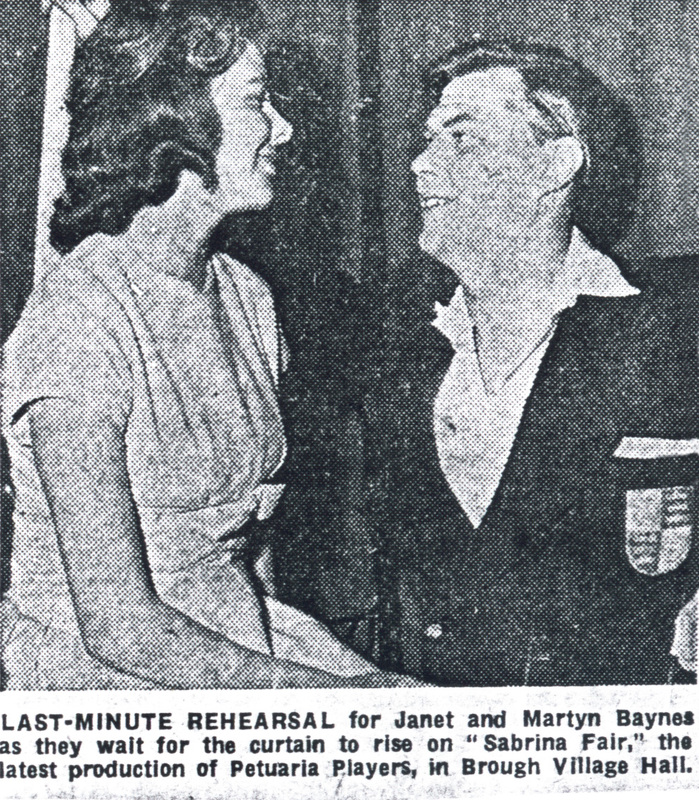 For the first play in March 1961 they chose “Sabrina Fair” in which Janet and Martyn had both appeared previously in Hull. The success was instant and plans for future plays began. Sabrina Fair, 1961. Our very first production. The original intention was to present three plays per year covering three different aspects, i.e. a thriller or mystery, a comedy or farce and a serious drama. In all three styles there was scope for period costumes to be used so one costume play could be considered per season. We have always striven to reach a high standard of perfection on and off the stage, and our sets have always been carefully planned. Early rehearsals were held in church halls, village hall kitchens and even in member’s homes until eventually a room above Charlie Ball’s D.I.Y. shop, now the Station Supper, became available until Charlie retired. A telephone call and appeal on Radio Humberside by our secretary of the time, Lorraine Scaife, resulted in a building being brought from Woodmansey. Members each loaned money to cover the cost of dismantling, transporting, the provision of a stable base and eventual erection of what became “The Forum” – further echoes of our Roman settlers. That all happened way back in 1980/1 and we are still there. into our repertoire has broadened our outlook and has been welcomed by our audiences. Positive feedback reinforces our opinions. Stepping Out was a milestone for the group. done – so much extra work. Unfortunately as rehearsals started Janet had to step down due to ill health so Richard Bateman took over. And from a play he maybe had doubts about it turned into a big stepping stone for the group. It was so well received that there was a waiting list for tickets and extra rows had to be put in. This was really the first play that we used a bare stage for the finale. This play opened up our belief in our own abilities as a group and made us realise we did not always have to have full walled sets. Audiences were happy to use their imagination. We could look at more local playwrights such as John Godber which need less scenery. We could look at more technical plays, more plays with dancing – suddenly we had expanded our boundaries and all because Janet made the group take a leap of faith.